The tragedy isn’t just the losses. We had two substantially complete tombs from the Valley of the Kings: we have lost items from not just one of these, but both. Very sad to hear the magazine at Dahshur was looted last night. After all that has happened it seems the pyramid fields are still not being properly protected to prevent further theft and damage. This kind of news terrifies me! Why didn’t the army ensure the museum was not robbed! And what happened to the security system! I agree, it must have been an inside(r) job. It seems ironic to lose items from Tut who was a revolutionary in his own time. Surely these priceless treasures will surface, all we can do is spread the word in hope that recognition will bring their return. 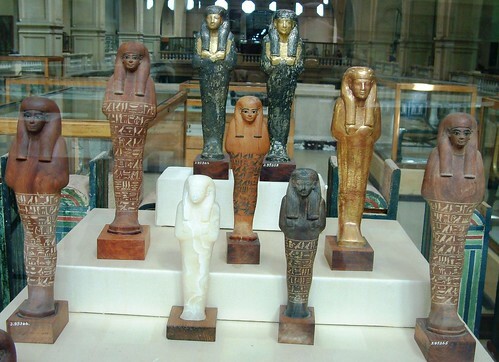 Sad that Egypt was looted by Mubarak for so much money…now someone has looted Egypts history. We can only hope that the thefts were done for monetary purposes as their going on the market often brings such objects home. It reminds me that there are people being held captive still in Egypt, heartbreaking to consider her history & past are being held captive now as well. Hopefully when the revolutionaries demands of freedom for all prisoners are met, these items return home as well. So heartbreaking. Do we know which of the two harpoon statues was stolen? That’s very sad… Hope they can find these treasures. It feels like art theft ‘to order’, as they specifically targeted Amarna objects, but is that so? What puzzles me, is the nature of the pieces. There were far nicer Amarna objects around than the ones they picked! Just imagine, what would you have picked if you had a choice to order such a theft, or if you yourself were there to do it on the spot? The limestone statue of Akhenaten holding an offering table would not have been my choice, just for its weight alone. Or that Yuya (?) 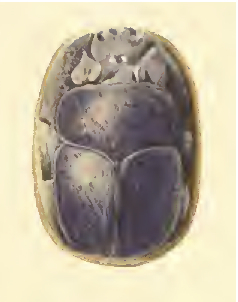 heart scarab… The Tutankhamen gilded statues, though not big, are difficult to transport and hide, while other maybe even nicer and smaller gilded pieces from the same tomb would have been available. A queer selection, indeed. Looks rather random in hindsight. This ‘theft’ thing doesn’t feel right. I strongly wonder if there is maybe other motive behind it. Hope that they will soon return to Egypt. Hans – I’m with you in much of what you say. 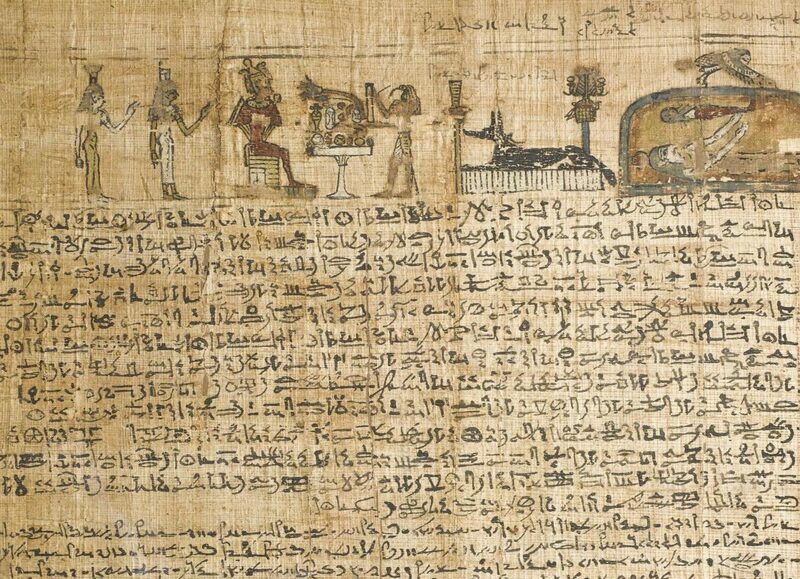 The Amarna connection is obvious – but why? It was dark in there; whomever took the objects might have mistaken them for others they were aiming for. And, these artifacts simply cannot be sold without great difficulty. It seems to me that it was obviously an “inside” job of sorts; by whom exactly, I don’t know. 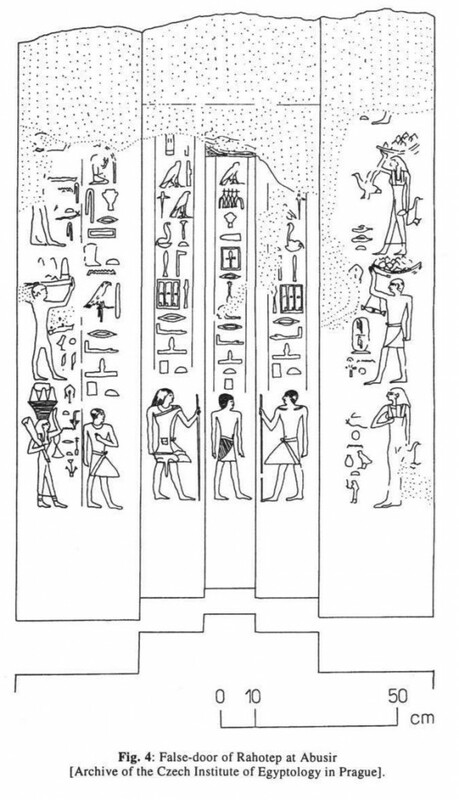 It might be the guys in charge of this poorly-thought out heist sent one or more guys down there to get specific things – with descriptions – but the actual robbers weren’t educated enough in Amarna art to get it right. Or, they got it right. All speculation. But, there seems to be many things going on here – other motives as Hans put it – that hopefully will come out. It is incredible that Dahshur is still not under guard. News today adds that De-Morgans storage magazine has now been looted a second time in two days. Obviously, all is NOT safe and secure as Hawass is repeatedly stating. 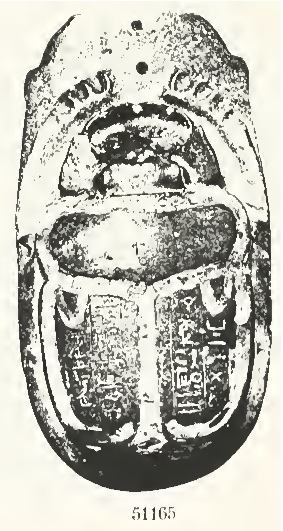 I became alarmed when the Hawas directives from the start sought to give blanket reassurances that all was well with artifacts ALL OVER Egypt. Alarm bells rang. Especially at the beginning of the turmoil. How could these assurances be given so confidently without recourse to communications and on-site checking at the different locations? The unprofessional attempts to assert unproven impositions that ‘all is well’ only succeeded in revealing panic and setting off alarm bells. Why have so many sites and museums in Egypt been so criminally and woefully inadequately guarded? To hear that there may have been no insurance attached to the museums is further alarming. Apart from the obvious, insurance premiums means that there are continual checks and balances for each and every object. Insurance thus acts as deterrent from internal theft. Mr Hawas has indeed a lot to answer for in his overall guardianship of his country’s and these world sites. This seems to me to be an inside job, pick up a few very expensive items which could be hidden easily, smuggled out easily and sold illegally to whoever is the willing buyer. I hope Interpol and Art Dealers collaborate and nab the thieves and their helpers. It was heartening to see a number of the non violent protesters link their arms up and form a human chain to guard the Egyptian MUseum after news broke out about the first thefts. Imagine how much worse things would have been if that had not been done. I have a sad heart for what has happened. So much history may be lost forever. I sympathize with everyone’s dismay at the thefts and the continued looting of Dashur. I fell in love with the Tutankhamun harpooning statue when I was 6 years old, and the Akhenaten statue is a masterpiece. The thieves must have either known what they were after or were very very lucky. I hope that more of the objects are found and security can be improved immediately- everyone’s contributions here and elsewhere are evidence of the importance the world places on the protection of heritage. 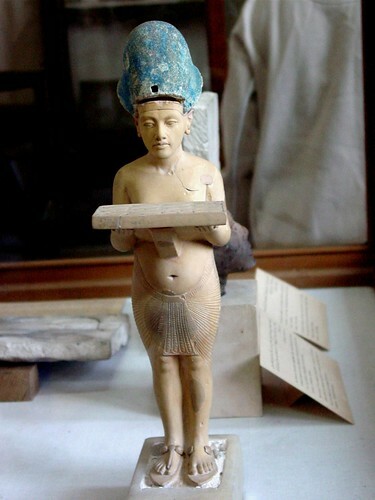 This is such sad news – I am a little confused though, an earlier statement from Zawi Hawass (around the 6th Feb) had stated a limestone statue of Akhenaten with an offering table had only been damaged, but a similar item now appears to have been stolen. Does anyone know if there are two examples conforming to this description? If you look carefully to the pictures of the looting and read the weblog of Zahi Hawass there is something very strange going on. I believe there is evidence that the stone objects stolen from the Amarna showcase 167 where still in the Egyptian Museum by historical Friday February 11. Sam- I believe they are one and the same (I posted about the identity of statue when it was first discussed as damaged: http://bit.ly/fCrG59). Huub- yes, according to previously released statements, the Akhenaten statue was supposedly still in the museum, but there may just have been confusion about its whereabouts rather than a second theft. Have you seen pictures to suggest they were still there until Friday? Huub has an interesting point. From the contradicting reports we cannot ascertain that some of the pieces were actually lost at the time of the break-in, unless we have some solid proof from witnesses or dated photographs. Sure, display cases were smashed and objects thrown around, but it may well be that some had already disappeared well before that time, or disappeared shortly after the event. But where would these objects go and who would want them? I am especially puzzled about the disappearance of the limestone statue of Akhenaten holding an offering table. It is a strange theft, unless someone specifically wanted this piece for his or her private collection — a priceless possession indeed for someone collecting Amarna pieces! I was pretty sure it was said that the small Akhenaten statue with the blue crown had been damaged and was being repaired – and then it was reported as being one of the stolen artifacts. As others and I have said, this looks like an “inside” job of sorts and it has a definite Amarna theme. We must remember that people have been in the museum since the night of the “break-in” – with broken cases just sitting there with artifacts in them. We don’t know how quickly any artifact was taken for repair or storage under lock and key – so many objects could be accessed by anyone in the museum through broken cases during the last weeks. I am not sure but I think, and I know this does not support my suspicion, that I have seen a picture of the damaged show case 167 with the statue of Akhenaten still inside. I might have seen it at one of the many websites but I can not find it anymore. Is there anybody out there who has seen it too or am I mistaking. I urgently call to all photographers who have been inside the Egyptian museum after January 28 to look for the evidence. It is impossible that after an inventarisation round two weeks later the museum personel found out that the world famous stone objects from the Amarna showcase 167 were all missing. Even more strange is the fact that the robbers took all the text labels too. And weren’t they only after gold? How could thieves escape the museum building in the first night with all the stone objects while there where thousands of vigilant protesters surrounding the building? Why was Wafa es Saddik replaced by Tarek el Awady in the last few days before Mubarak left? There must be museum staff or Egyptian soldiers who can inform us about the situation of the Amarna gallery in the first two weeks after the breaking in. It clearly shows the two opposing display cases in the museum. One holds a Tutankhamun harpooning statue and a statue of the Farao standing on the black leopard. The opposing display case is the one that was smashed by the thieves. 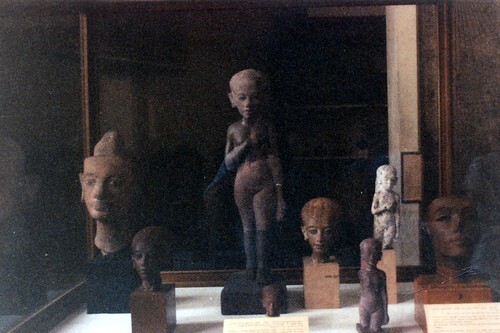 It contained four statues of which two are similar to the ones in the other showcase. The second Farao on black leopard statue was smashed but currently is undergoing restoration. 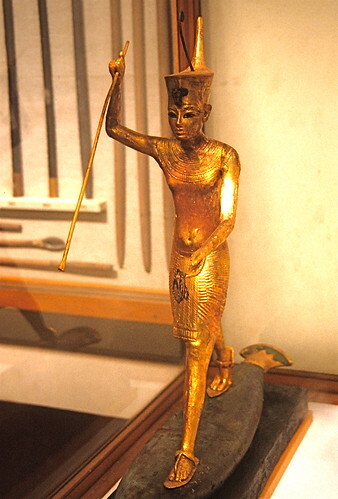 Of the second Tut harpooning statue the torso is missing. 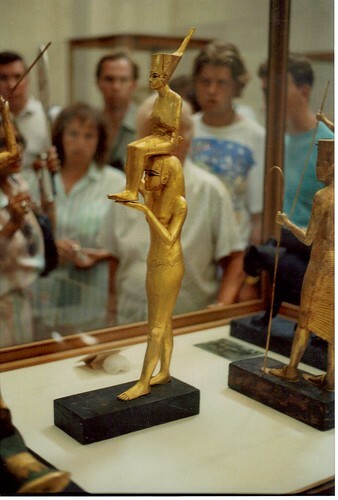 The statue of Tutankhamun being carried by a goddess was stolen, but fragments were found. The statue of the Farao holding a staff is assumed to be on an exhibition tour in the U.S.A. The main difference between the two Tutankhamun harpooning statues is in the red crown. On one of the statues the crown has a curly wire, representing the proboscis of a honey bee. The video mentioned in my previous comment seems to indicate the harpooning statue with the curly wire was displayed in the case that wasn’t affected by the looting. The stolen statue is the one without the curly wire. Inventory number is JE 60709. Huub, my mind maybe playing tricks on me, but i’m pretty sure I’ve also seen a photo of the display cabinet in question – with broken glass and the figure still within it, taken before the 12th. I’ve just taken a look at National Geographic’s NewsWatch and Zawi Hawass has said he was misinformed by a member of staff regarding the statue (stolen not damaged as he originally thought). I wonder if the Wall Street Journal would be the place to go? Their photographer was given access – I’d be surprised if no images were taken. Kate – I’ve studied Mesehti’s model extensively (PhD) if someone wants to know how it’s constructed. Margaret, I just wanted to thank you for having this blog. I found it looking for information on the damage of the ancient Egyptian antiquities in recent times. I am an a lover of ancient Egypt and it is sad to see what people have done to things lately. Keep up the good work and thanks again. Previous PostPrevious History is in the making, but can we piece it back together again?